Rebecca Hammer, deputy director for federal water policy at the Natural Resources Defense Council, focused on how the changes to the rule could be clarified to apply to municipalities with combined sewer systems. "We also support the proposed clarification that the rule's water quality requirement applies to properties located in combined sewer areas. 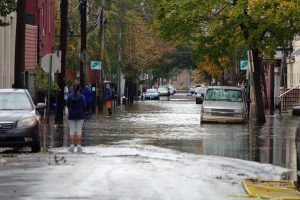 And while we continue to believe that the universe of regulated sites must be further expanded to include small sites and redevelopment, we support the current proposal's more limited amendments to the definition of major development, which will help to capture more projects and thereby reduce the impact of development on local waterways and infrastructure." Read New Jersey Future’s initial comments on the proposed rule.